PORTER’s first-ever cover girl, the world’s top-earning supermodel for 15 years straight and business powerhouse, Gisele Bündchen, returns to talk to the global fashion magazine for the title’s fifth anniversary issue about the power of female solidarity, her husband Tom Brady’s love of fashion and the crisis that led her to rethink her entire life: “No longer numbing myself with smoking, drinking and too much work, I was becoming more and more aware of things that I’d chosen not to look at”. The 38-year-old Brazilian supermodel talks candidly to Carolyn Kormann for the Spring issue (on sale February 8). Photographed in New York by fashion heavyweight Mario Sorrenti and styled by George Cortina, Bündchen is shot in a series of natural portraits showcasing her lioness beauty and pure spirit. 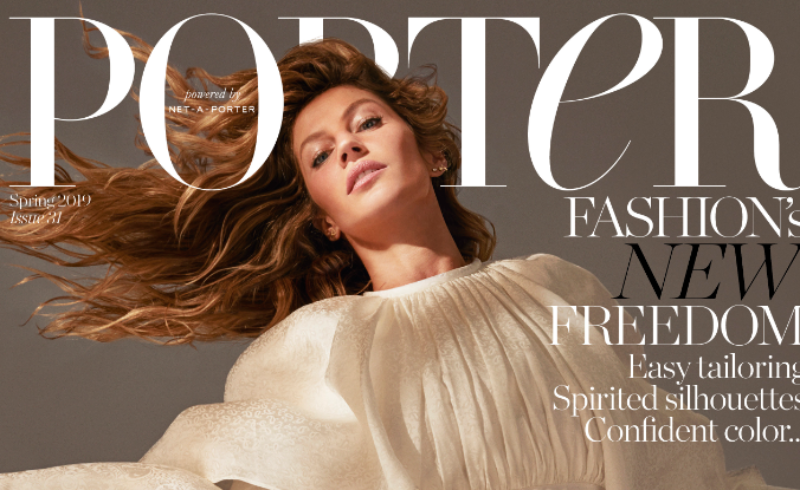 To mark the fifth anniversary of PORTER, Bündchen will cover both the print and weekly digital edition magazines. For the first time in PORTER’s history the digital cover, shot by Sorrenti, will be animated showcasing the multi-platform capability of this truly innovative title.